The road is passable by experienced drivers in SUVs and normal-clearance vehicles like Honda cars, but includes rough sections especially from the upper bridge to camp. Rapidan Camps is opposed to opening the gate along the remote unimproved road along our property. View our statement. Rapidan Camps is a cooperative camp, providing a secluded vacation retreat in the Blue Ridge mountains. It is owned, operated, and maintained by a group of approximately 100 member families. We rent to members and to responsible non-members. 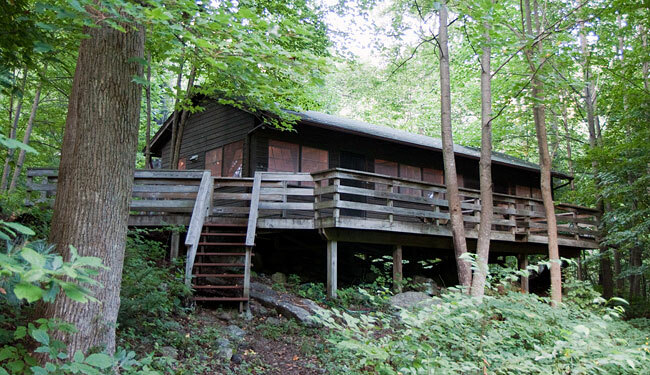 The camp consists of five cabins, surrounded by forest land owned by the state of Virginia (the Rapidan Wildlife Management Area), which is ringed by Shenandoah National Park. The Rapidan River, a pristine cold-water mountain trout stream tumbling over large rocks, flows adjacent to the site, which is approximately 15 miles from the town of Madison, Virginia, or 100 miles from Washington, DC, by car—or about four miles from Big Meadows along Skyline Drive and the Appalachian Trail on foot. The four original cabins were constructed by the US Marine Corps as an extension to Camp Hoover (the predecessor of Camp David) within Shenandoah National Park one mile upriver. Non-members may now receive confirmation of their reservations 60 days in advance.